This was the year that life for this generation of Americans would change forever. This was the year that the Farrar’s took this family photo. Standing, back row, L to R: George Edwin (Ed, my dad), Bob Hunt (Janet’s husband), Janet Mae, Ozzie Couch (close family friend), Carroll Johnson Jr. Standing, middle row, L to R: Martha Ann, Dorothy Gertrude (Dot) holding daughter Phyllis, Raleigh May, Carroll Johnson Sr.
My grandparents, Raleigh May and Carroll Johnson Farrar, Sr., had nine children twenty-seven years apart. The oldest was born in 1910 and the youngest in 1937. Of the nine children, four would be directly involved in the war effort, three sons and one daughter. Nell Geraldine, the oldest child and first daughter, was born in 1910. Gerry married Wallace Mass in 1932 and moved to California. She was the only Farrar child to permanently move out of the state of Georgia and away from the closeness of the Farrar family. Janet Mae was born in 1912. She married Bob Hunt (pictured) in 1936. During WWII, Janet joined the Georgia division of Bell Aircraft (known as Bell Bomber) in Marietta, Georgia, contributing at home to the war effort. She was hired as their very first policewoman in March 1943. Bell Bomber supplied the U.S. Army Air Forces with Boeing-designed B-29’s. Carroll Johnson, Jr. was the first son, born in 1916. Carroll, Jr. enlisted in the US Army Air Corps on August 13, 1941. He served in Army Air Force Service Squadron 315 in the Pacific. Dorothy Gertrude was born in 1919. She married Hugh Cobb in late 1936 or early 1937. 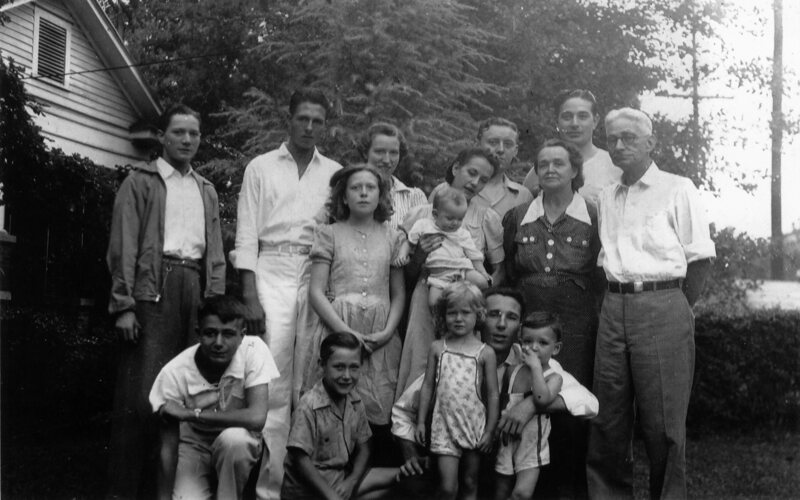 Dot and Hugh followed in her parents’ footsteps and had nine children of their own. Included in the photo are the couples two oldest children, Denny and Phyllis. George Edwin (my dad) was born in 1921. Ed enlisted June 4, 1942. He served in the Mighty Eighth Air Force in the 384th Bomb Group as a waist gunner of a B-17 crew stationed in England. He was knocked down on his sixteenth mission and became a prisoner of war. Robert Burnham was born in 1925. Bob enlisted in the Navy on May 8, 1943. He served in the Pacific on the USS Intrepid and was injured when it was attacked by two Japanese kamikaze pilots on November 25, 1944. Martha Ann was born in 1927. Harold Eugene (Gene) was born in 1931. Beverly Marie was born in 1937. During WWII, Gerry, Janet, and Dot were married and living away from home. Carroll, Ed, and Bob were still living at home at the start of the war, but would all be far from home during their WWII service. Martha, Gene, and Beverly were the only children left to grow up in the family home during the war years. The only person in the picture who has not yet been mentioned is a friend of the family named Ozzie Couch (I’m unsure of the spelling of his name). Ozzie and Carroll Jr. both worked at Rich’s Department Store in Atlanta. Ozzie’s inclusion in the family photo says something about his closeness to the Farrar family. Youngest daughter Beverly remembered that Ozzie brought many gifts to the family including a variety of plants, Beverly’s first Persian cat, and a retired circus horse named Danny Boy that lived for a time in the garage. Ozzie’s family was from North Carolina. Ozzie, too, served in WWII. I am curious about Ozzie and would like to find out more about him. If anyone reading this can tell me more about Ozzie Couch (sp. ), please contact me. Did the Farrar family, sensing the war moving right into their living room, take this photo in 1941 wondering if it might be the last photo of them all (except for Gerry) together? Many families lost sons to WWII, but the Farrar family was fortunate to see all three of their sons – Carroll, Ed, and Bob – and even family friend Ozzie return from the war. A family intact. By thearrowheadclub in Farrar Family on February 21, 2018 .